Choose Web Forms in the Dashboard menu and click Create new or Web Forms list to edit an existing web form. In the Settings step, click the button beside Custom Thank-you page and enter the URL where you want contacts forwarded after they subscribe. 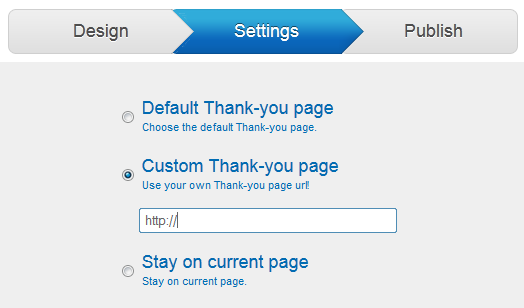 To customize Default Thank-you page select particular option from the list. If you choose to make your Thank-You page dynamic, each new subscriber sees a short film with instructions on how to confirm. You can also add video or audio to default page. It is not possible to specify a custom error page. However, by clicking the show advanced link on the lower right, you can customize the message displayed when an invalid email is entered. When finished, click the Save web form button at the bottom of the page.